This article is about the eponymous island, the administrative unit, and the jurisdiction of Guernsey. For the whole Bailiwick, see Bailiwick of Guernsey. For the movie, see Guernsey (film). For other uses, see Guernsey (disambiguation). Guernsey (/ˈɡɜːrnzi/ ( listen)) is an island in the English Channel off the coast of Normandy. It lies roughly north of Saint-Malo and to the west of Jersey and the Cotentin Peninsula. With several smaller nearby islands, it forms a jurisdiction within the Bailiwick of Guernsey, a Crown dependency. The jurisdiction is made up of ten parishes on the island of Guernsey, three other inhabited islands (Herm, Jethou and Lihou), and many small islets and rocks. The entire jurisdiction lies within the Common Travel Area of the British Isles and is not a member of the European Union, but has a special relationship with it, being treated as part of the European Community with access to the single market for the purposes of free trade in goods. Taken together with the separate jurisdictions of Alderney and Sark it forms the Bailiwick of Guernsey. As part of the peace between England and France, Pope Sixtus IV issued in 1483 a Papal bull granting the Privilege of Neutrality, by which the Islands, their harbours and seas, as far as the eye can see, were considered neutral territory. Anyone molesting Islanders would be excommunicated. A Royal Charter in 1548 confirmed the neutrality. Not that the French behaved, as they attempted to invade Jersey a year later in 1549 but were defeated by the militia. The neutrality lasted another century, until William III of England abolished the privilege due to privateering activity against Dutch ships. During the late 1940s the island repaired the damage caused to its buildings during the occupation. The tomato industry started up again and thrived until the 1970s when it hit a sharp, terminal decline. Tourism has remained important. Finance businesses grew in the 1970s and expanded in the next two decades and are important employers. Guernsey's constitutional and trading relationships with the United Kingdom and the European Union will be unaffected by Brexit. The deliberative assembly of the States of Guernsey (États de Guernesey) is called the States of Deliberation (États de Délibération) and consists of 38 People's Deputies, elected from multi- or single-member districts every four years. There are also two representatives from Alderney, a semi-autonomous dependency of the Bailiwick, but Sark sends no representative since it has its own legislature. The Bailiff or Deputy Bailiff preside in the assembly. There are also two non-voting members: H.M. Procureur (analogous to the role of Attorney General) and H.M. Comptroller (analogous to Solicitor General), both appointed by the Crown and collectively known as the Law Officers of the Crown. Guernsey has ten parishes, which act as civil administration districts, with limited powers. Each parish is administered by a Douzaine, usually made up of twelve members, known as Douzeniers. Douzeniers are elected for a six-year mandate, two Douzeniers being elected by parishioners at a parish meeting in November each year. The senior Douzenier is known as the Doyen (Dean). Two elected Constables (Connétables) carry out the decisions of the Douzaine, serving for between one and three years. The longest serving Constable is known as the Senior Constable and his or her colleague as the Junior Constable. The Douzaines levy an Occupiers Rate on properties to provide funding for running of the administration. Public services, such as water, wastewater, the two main harbours and the airport are still owned and controlled by the States of Guernsey. The electricity, and postal services have been commercialised by the States and are now operated by companies wholly owned by the States of Guernsey. Gas is supplied by an independent private company. In 1998, Guernsey and Jersey jointly formed the Channel Islands Electricity Grid to operate and manage the submarine cables between Europe and the Channel Islands. The installation of these cables provided the island with a secure form of backup power, having previously only had access to diesel generators. As of 2014, the finance industry forms the largest economic sector in Guernsey, generating around 40% of Guernsey's GDP and directly employing around 21% of its workforce. Banks began setting up operations in the island from the early 1960s onwards in order to avoid high onshore taxes and restrictive regulation. The industry regulator is the Guernsey Financial Services Commission, which was established in 1987. Personal tax liability differs according to whether an individual is resident in the island or not. Individuals resident in the Jurisdiction of Guernsey (which does not include Sark) pay income tax at the rate of 20% on their worldwide income, whereas non-residents are only liable on income arising from activity or ownership within Guernsey. Unlike in the UK, the income tax year in Guernsey aligns to the calendar year. The population is 63,026 (July 2016 est.). The median age for males is 40 years and for females is 42 years. The population growth rate is 0.775% with 9.62 births/1,000 population, 8 deaths/1,000 population, and annual net migration of 6.07/1,000 population. The life expectancy is 80.1 years for males and 84.5 years for females. The Bailiwick ranked 10th in the world in 2015 with an average life expectancy of 82.47 years. Teaching in Guernsey is based on the English National Curriculum. There are 10 primary schools, plus two junior schools and three infant schools. As of 2017, the island still has the 11-plus exam and pupils then transfer to one of four 11–16 secondary schools, or a co-educational grammar school. There are also three fee-paying colleges with lower schools, for which pupils over 11 receive grant support from the States of Guernsey. In 2016, the States of Guernsey voted to end the use of the 11-plus exams from 2019 onwards. It is also responsible for education on the neighbouring islands. In those sporting events where Guernsey does not have international representation, but the British Home Nations are competing separately, highly skilled islanders may choose to compete for any of the Home Nations. There are, however, restrictions on subsequent transfers to represent other Home Nations. The football player Matt Le Tissier, for example, could have played for the Scottish or Welsh football teams, but opted to play for England instead. Football in Guernsey is run by the Guernsey Football Association. The top tier of Guernsey football is the FNB Priaulx League where there are seven teams (Belgrave Wanderers, Northerners, Sylvans, St Martin's, Rovers, Rangers and Vale Recreation). The second tier is the Jackson League. In the 2011–12 season, Guernsey F.C. was formed and entered the Combined Counties League Division 1, becoming the first Channel Island club ever to compete in the English leagues. Guernsey became division champions comfortably on 24 March 2012, they won the Combined Counties Premier Challenge Cup on 4 May 2012. Their second season saw them promoted again on the final day in front of 1,754 'Green Lions' fans, this time to Division One South of the Isthmian League, despite their fixtures being heavily affected not only by poor winter weather, but by their notable progression to the semi-finals of the FA Vase cup competition. They play in level 8 of the English football pyramid. The Corbet Football Field, donated by Jurat Wilfred Corbet OBE in 1932, has fostered the sport greatly over the years. Recently, the island upgraded to a larger, better-quality stadium, in Footes Lane. 1 2 Ogier, Daryl Mark (22 March 2005). The Government and Law of Guernsey. The States of Guernsey. ISBN 978-0954977504. ↑ Hocart, Richard (2 October 2010). Guernsey's Countryside: An Introduction to the History of the Rural Landscape. Guernsey: Societé Guernesiaise. ISBN 978-0953254798. ↑ "Gallo-Roman Ship". Guernsey Museums & Galleries. Retrieved 22 November 2017. ↑ "Royal Guernsey Militia Regimental Museum". Guernsey Museums & Galleries. Retrieved 24 September 2017. ↑ Ogier, Daryl Mark (23 January 1997). Reformation and Society in Guernsey. Boydell & Brewer. ISBN 978-0851156033. ↑ "History of the Castle". Guernsey Museums & Galleries. Retrieved 19 September 2017. ↑ Parks, Edwin (1992). Diex Aix: God Help Us – The Guernseymen who marched away 1914–1918. Guernsey: States of Guernsey. ISBN 1-871560-85-3. ↑ Renouf, John (May 1985). "Geological excursion guide 1: Jersey and Guernsey, Channel Islands". Geology Today. 1 (3): 90. doi:10.1111/j.1365-2451.1985.tb00293.x. Retrieved 17 November 2017. ↑ Dawes, Gordon (1 May 2003). Laws of Guernsey. Oxford: Hart Publishing. ISBN 9781847311856. ↑ Hotchkiss v. Channel Islands Knitwear Company Limited , 207 (2001). ↑ ""The Alderney (Application of Legislation) Law, 1948". Act of 22 December 1948. Retrieved 30 November 2017. ↑ "LIFE EXPECTANCY AT BIRTH". CIA. ↑ UK Parliament. Immigration Act 1971 as amended (see also enacted form), from legislation.gov.uk. ↑ UK Parliament. British Nationality Act 1981 as amended (see also enacted form), from legislation.gov.uk. ↑ House, John (1988). Renoir in Guernsey. Guernsey Museum & Art Gallery. p. 3. ISBN 1 871560 81 0. Retrieved 29 November 2017. ↑ "HEALTH Milk protein blamed for heart disease". BBC News. 9 April 2001. Retrieved 31 May 2011. ↑ "A Novel of Life In a Small World". The New York Times. 19 April 1981. Retrieved 29 November 2017. ↑ "H.W. Fowler, the King of English". The New York Times. 10 December 2009. Retrieved 29 November 2017. 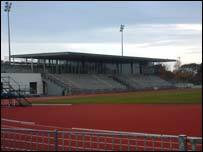 ↑ "BBC photo of Guernsey Stadium". Retrieved 31 May 2011. ↑ "Guernsey". International Cricket Council. Retrieved 14 November 2017. ↑ Connaughton, Mick (31 August 2004). "Racing: Guernsey racecourse ready for revival after gap of 13 years". The Independent. Retrieved 14 November 2017.
Cooper, Glynis (31 October 2006). Foul deeds & suspicious deaths in Guernsey. Wharncliffe Books. ISBN 978-1845630089. Crossan, Rose-Marie (24 September 2015). Poverty and Welfare in Guernsey, 1560-2015. Boydell & Brewer. ISBN 978-1783270408. Jamieson, A.G. (1986). A people of the sea. Methuen. ISBN 0-416-40540-1. Sebire, Heather (1 November 2005). The Archaeology and Early history of the Channel Islands. The History Press. ISBN 978-0752434490.